It has been one crazy year in the world of natural resources in the Florida panhandle. I guess the top stories would be the red tide and, of course, Hurricane Michael. Both had an impact environmentally and economically in the area. 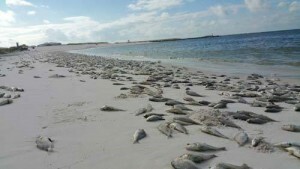 Dead fish line the beaches of the Florida Panhandle after a coast wide red tide event in October of 2015. We did not see the red tide in the panhandle until late summer. The folks in southwest Florida had been dealing with it since late winter. Down there, large fish kills were driving away tourists and halting the charter fishing industry. People began canceling their hotel reservations and moving to the east coast of the state, which eventually had red tide as well. One report showed a 6% decrease in tourism for that region, may have been more. 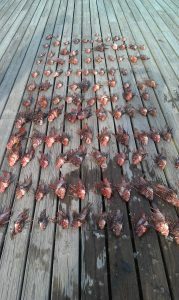 It was certainly devastating and there is now a bill in U.S. congress to fund red tide research and monitoring. They are wanting to be able to predict them better, and possibly reduce their impacts. Here in the panhandle the economic impact was not as large. 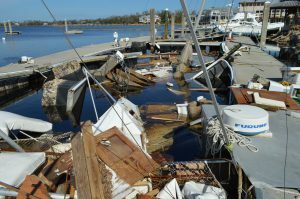 One, it came later in the year – beyond our busy season, and two Hurricane Michael occurred, which had a far greater environmental and economic impact. 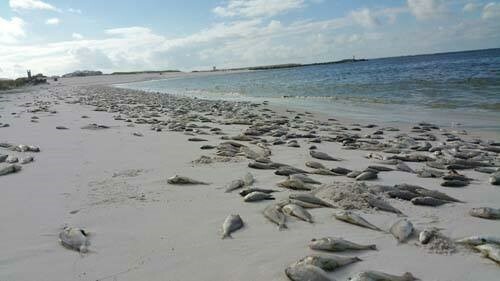 That said, FWC will continue to monitor for red tide and hope it will not be a story this year. Hurricane Michael was huge as far as environmental and economic impacts for the natural resources in the region. Charter captains either had no boats, no crew, no marina, or no customers – in some cases, all of the above, and business suffered. For some fishing interest, we were past the closed season but for divers, and other fishing interest, the loss was definitely felt. It was no different for the commercial fishing industry. In addition to boat, crew, and marina issues, oyster cages in the Apalach area were tossed up on beaches or lost all together. Product leaving the area, if you could harvest, was okay – but for those looking for local seafood in the area you had the problem with closed restaurants and seafood markets. Here is an example of the damage to local marinas and vessels that service our local fisheries. Unseen is the economic damage to fishing crews and supporting shore base businesses such as seafood processors, bait and tackle shops, and tourism related businesses. (Photo by Allen Golden). Above the coast, there were problems with downed trees – making commuting impossible and, in some cases, costing landowners a lot of money. Pecan orchards were hit hard, as were some of the timber interest. There were reports of livestock loose due to crushed fences from downed trees. Those they could hold on to did not have barns to put them in and feed was in low supply. Then you had to be concerned about the quality of the water. Excessive rain equals high levels of bacteria, even in private wells there could be contamination. With time all things tend to return. Some local residents may be restoring their natural resources for some time, others may be back in business now. It was a tough hit for the area this year. Other natural resource notes for 2018 include bear sightings. This continues to be an issue in the panhandle, particularly in Santa Rosa County. 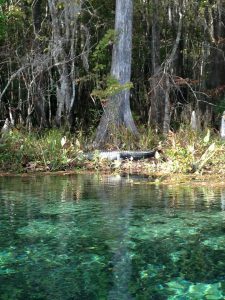 There have been manatees visiting the Big Lagoon area of Pensacola Bay during the last two years – something they do not often see. Also, in the Pensacola area has been an increase in calls about venomous snakes. Hard to say if there are more snakes than there once were, or whether they are becoming more visible, but it was a story that we will continue to watch this year. At the 2018 FWC lionfish summit it was mentioned that lionfish are harder to find in waters shallower than 120’, this is good news. The story is not over yet but seems the harvesting we have been doing has helped. We will be having a regional lionfish workshop February 19 in Ft. Walton Beach for those interested in learning more about this issue. That will be followed the next day with a workshop on local artificial reefs. Registration information will be posted soon. As we now look at 2019 there will certainly be new natural resource stories. 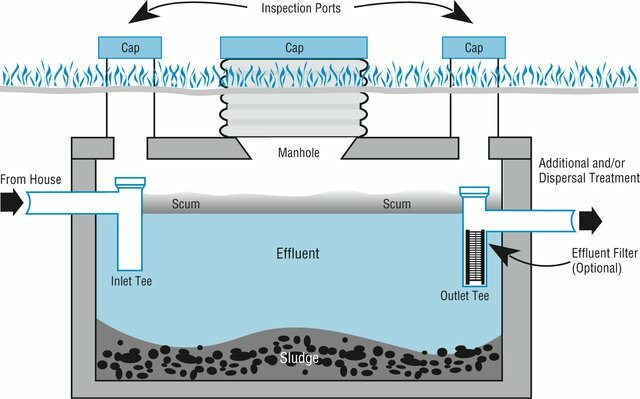 There are a couple of bills recently introduced at the state level dealing with septic tank inspections, lawn fertilizer, maintaining our springs, and sewage spills designed to help improve water quality – we will see what happens with those. There is much discussion on coastal resiliency and how to reduce the impacts of future hurricanes and we will continue to monitor changes in our area such as invasive species and mangrove distribution. If you have a topic you would like to see an article about, please let us know. We hope you had a great holiday season and we look forward to a good new year. Our first POL program will happen this week – August 17 – at the Navarre Beach snorkel reef, and is sold out! We are glad you all are interested in these programs. Well! We have another one for you. 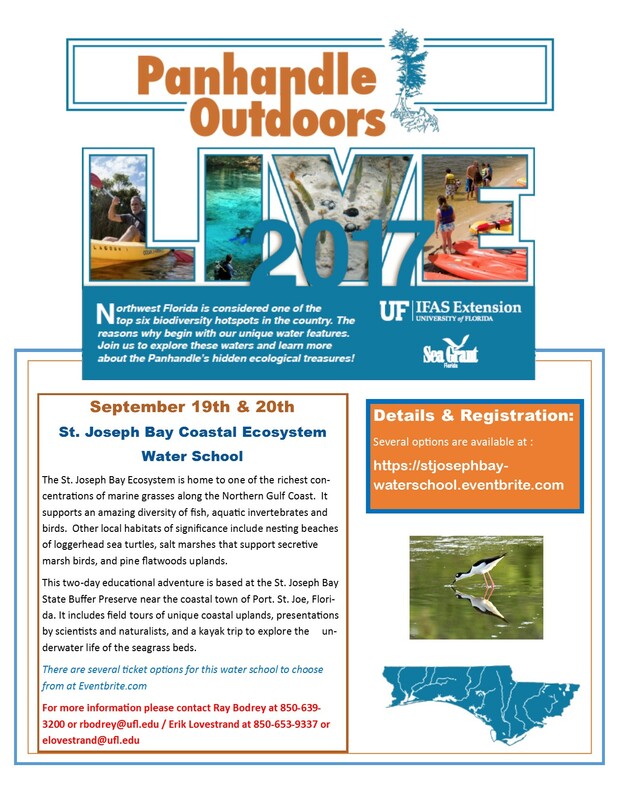 The Natural Resource Extension Agents from UF IFAS Extension will be holding a two-day water school at St. Joseph Bay. 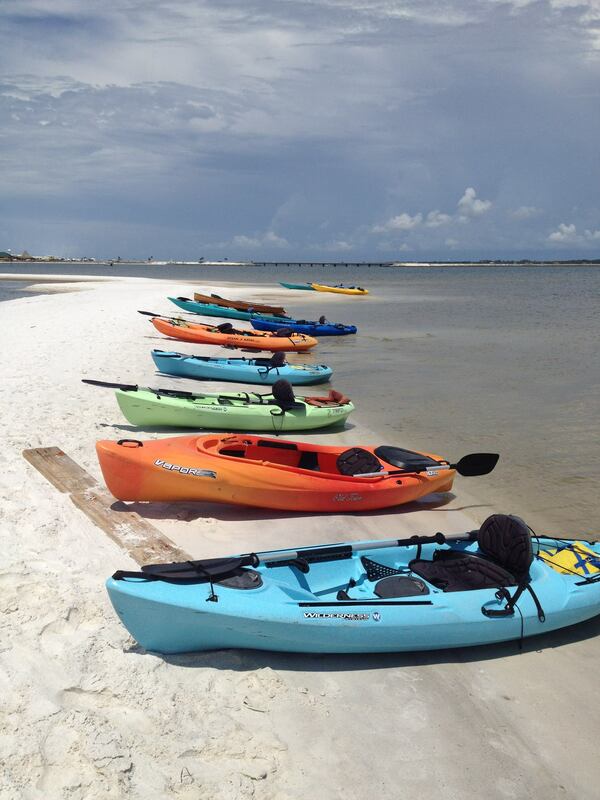 Participants will learn all about the coastal ecosystems surrounding St. Joe Bay in the classroom, snorkeling, and kayaking. Kayaks and overnight accommodations are available for those interested. This water school will be September 19-20. For more information contact Extension Agent Ray Bodrey in Gulf County or Erik Lovestrand in Franklin. Information and registration can be found at https://stjosephbay-waterschool.eventbrite.com.